6 Finish Rejuvenator Enough for all your Wood Restoration. GREAT FOR BIG JOBS OR JUST STOCK UP AND SAVE. KITCHEN CABINET Cleaner, ANTIQUE Cleaner, FURNITURE Cleaner and Restorer..One Product does it all! Front doors to wood floors and everything in between! 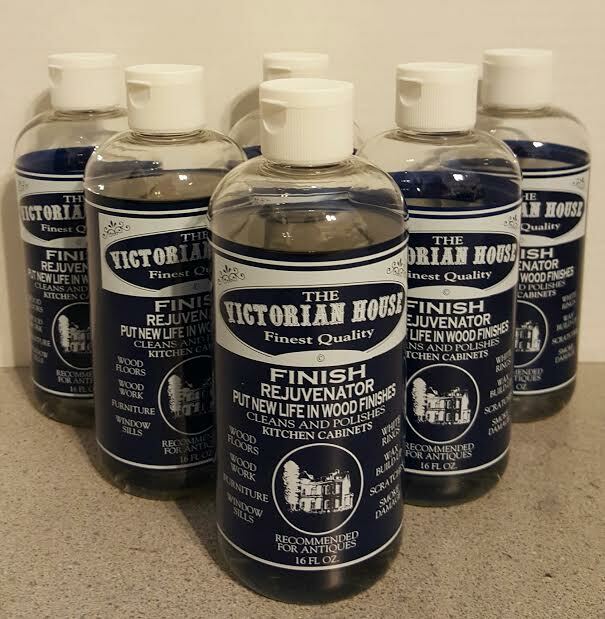 6 bottles of The Victorian House Finish Rejuvenator. A great way to stock up for your upcoming jobs or stock your mall space or sell at the flea market. Makes great gifts too. SAVE MONEY AND ORDER TODAY. 1. SHAKE IT UP.. 2.PUT IT ON . .. 3.WIPE IT OFF EASY!! The Victorian House Finish Rejuvenator is Not a cover up this is a repair for your original finish. (Bottles are not filled to the top for a reason--it must be mixed so shake well and often to keep it mixed.) Not for use for water base Paint. The Victorian House Kitchen Cabinet Clenaer --Just the right size. thanks for adding this selection. I often order the product so I know it works very well but even the 2 bottle special wasn't always what I needed for my job. I flip houses and buy and sell antiques so I use quite a bit. Thanks again..the shipping included really helps a lot on my budget. Kitchen Cabinet Cleaner and so much more! Does The Job!! Of course I bought a single bottle first but soon figured out that it was gonna work great on our renovation on an old apartment building in Okmulgee,Oklahoma. Love the fast shipping from a company right here in our home state. We have about 15 more apartments to do and the wood work is not painted--lucky us. We have found it easy to just do about a 5 foot section at a time and wipe as we go. The doors are all solid oak and the trim is mostly a pine with all original finishes. Excellent product. We got free Shipping which was a plus.